Simple to connect with your computer with the USB cable included. Built in rechargeable battery with up to 6 hours play time. 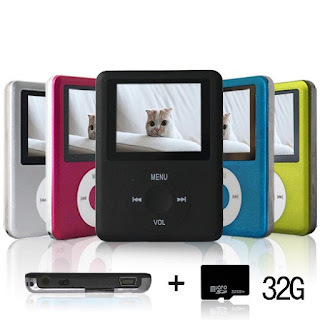 Lecmal Portable MP3/MP4 Player with 32G Micro SD Card Mini USB Port is awesome! I absolutly love how much memory it has. I have tons of songs, pictures and videos stored on it and have room for much more. I also love the screen. It looks great and seems to hold up well to being dropped as my kids have dropped it a few times. I also really like that it comes with a 32G Micro SD Card which makes transferring data to another device easy. This Lecmal Portable MP3/MP4 Player is also extremely lightweight and fits in my pocket easily. I found it extremely easy to use and love that it comes in many different colors. I highly recommend this Lecmal Portable MP3/MP4 Player!